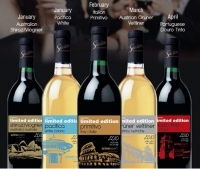 Selection Limited Edition Series features a limited number of outstanding unique varieties from around the world that are released annually from January through April. Don't forget to try out our Limited Edition game and contest at www.limitededition2010.com. concentrated flavour, aroma and body. The Wine: Blending red and white grapes brings lush balance to this lively, deep ruby wine. Ripe berry fruit and violet aromas from the Shiraz are balanced by floral and stone fruit notes from the Viognier, with beguiling hints of orange blossom followed by toast and smokiness. There’s sufficient acidity to give it structure, but the overall impression is soft and velvety. The long, gentle finish is ripe and appealing with surprising complexity. The Food: A great choice for game or meat dishes, it also works spectacularly with ratatouille and even soft fruit, especially combined with soft-ripened or goat’s cheeses. It’s also great all by itself as an elegant sipping wine. Ageing: Appealingly bright and fruity when young, it will develop more of its floral aromas after six months, and after a year will begin to show violets and blackberry flavours, and continue to deepen in flavour. and Sauvignon Blanc and Viognier from the hot sunny mornings and cool afternoons of California’s North Coast, each vineyard also has unique soil ranging from sandy river bottom loam, to stony red clay, and nearly pure limestone. The Wine: Pacifica White showcases bright fruit, excellent structure and a long layered finish running out from a veritable fruit salad of flavours and aromas. Complex pear and honey notes, grassy citrus and grapefruit, ripe apple, fig, melon, peach, and pineapple all mellow into spicy, honey, butter, butterscotch and hazelnut flavors that linger beguilingly. The Food: Full-bodied yet supple, this wine has a range of fruit characters and enough acidity to stand up to a wide range of foods. Off dry, but perfectly balanced it works well with spices, seafood, clams, mussels in saffron cream, and especially with Asian food. Ageing: Delicious and ready to drink almost immediately, this wine has the ability to change with time, evolving dominant notes from one grape to the next. Sauvignon Blanc’s citrus and herbs provide crispness early on, giving way to melon and honey notes of Semillon, then Viognier rises to show stone fruit, flowers, ripe apricots and candied orange peel while Chardonnay asserts its green apple and notes of white fruits and minerals. The Food: Primitivo shines in the company of assertively flavoured foods like lamb, pork, grilled beef, ribs, roasted red meats, wild game, spicy cheeses and pizza. Its firm backbone of acids and tannins make it work well with rich and spicy foods like Italian sausages or lasagna. Ageing: Medium-bodied but with good grip and intensity, this wine will begin to open up after six months, the richer flavours will show at 12 months. The Region: Grüner Veltliner is almost unique to the Niederösterreich, Austria’s growing region along the Danube River North of Vienna. It finds its finest balance in loess, the fine-grained, densely compacted glacial dust that has blown in to the vineyards over many thousands of years. This unique terrior is largely responsible for the distinctive characteristics of arguably Austria’s greatest asset. The Wine: Grüner Veltliner produces stunningly intense and concentrated wines that start with citrus and grapefruit aromas, hinting from the very beginning at the variety’s most distinguishing characteristic, the spicy fragrance of freshly ground white pepper. In addition to white pepper they can also show aromas of sour apples, flowers and minerals —surprisingly delicate. The Food: The steely dryness and bracing acidity of Grüner Veltliner works brilliantly with seafood, mussels, salmon, grilled halibut, fish stew, and grilled oysters. Ageing: This wine has huge ageing potential. After three months in the bottle it will present bright, simple flavours of citrus, but after a year the tropical fruits will come out to duel with the white pepper. The Region: The Douro valley is Portugal’s premium wine region. Situated along the Rio Douro (River of Gold), the scenery is spectacular and the soil is just about perfect for growing quality wine grapes. The climate is continental, very hot and desert-dry in the summer; cold and wet in the winter. Douro’s most memorable feature is its difficult terrain. Most of the slopes are so steep that the only way to grow anything is by creating terraces, the painstaking construction of dry stonewalls to support the banks of soil. The Food: Incredibly flexible as a food wine, Douro Tinto will match perfectly with roasted lamb, or duck, barbecued meats, grilled eel and meat sauces. The finesse and complexity also make it intriguing just on its own. Ageing: This wine will show black fruit, plums and a firm structure of acid and tannins. Six to twelve months will reveal more floral aromas and a hint of ripe berries and cassis.